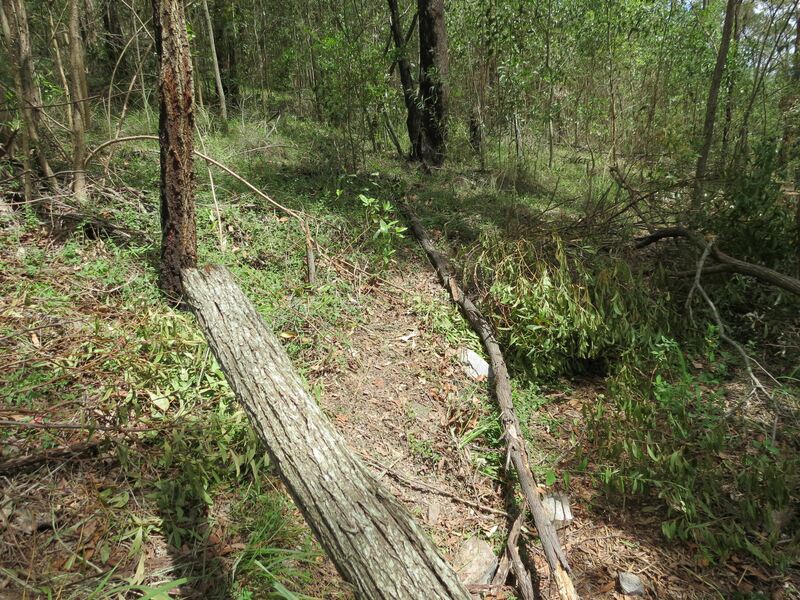 Over the last two days I have walked the tracks in the Reserve to see what damage was done by last week’s storm. 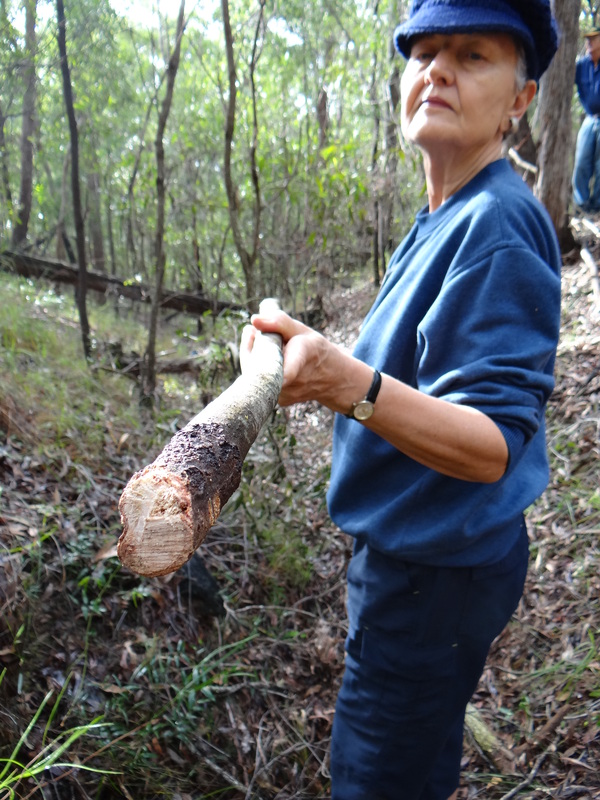 Being a mountain flooding is not a problem however we have lost a significant number of large eucalypts, a number of Casuarinas and a significant number of dead old trees (stags) which are often important habitat because of their nest hollows. 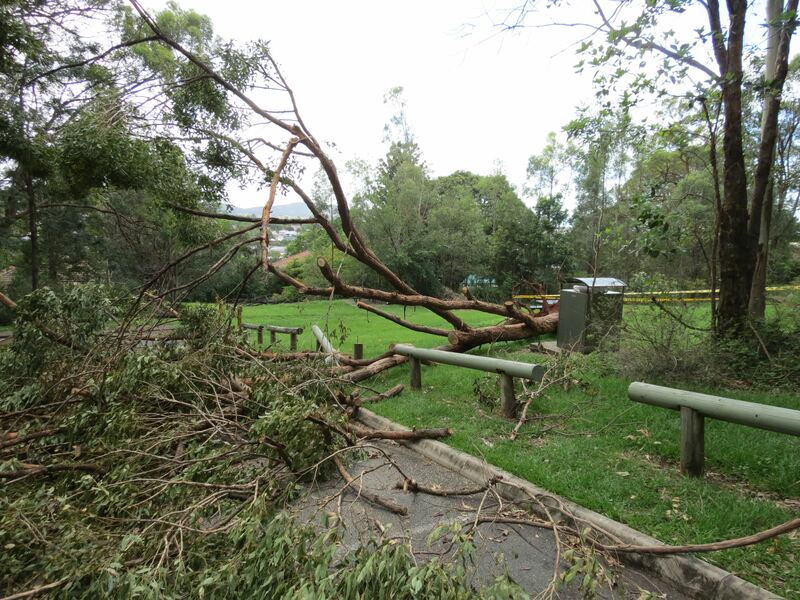 A number tracks are blocked by fallen trees which will take time to clear as the Council teams prioritise clean up work. However, the storm has created some unexpected benefits for the habitat as fallen trees have blocked tracks used by illegal downhill mountain bike riders. We have had a number of reports that mountain bike riders have been seen in the Reserve so I also walked the areas that have been damaged illegal riding. I found some evidence of bike riding including clearing of logs placed by Council contractors to block tracks and minimise further erosion. So I was pleased to find a number of tracks blocked by large branches broken in the storm. I am also heartened by seeing wildlife thriving in the post storm environment. … and a previously unrecorded dragonfly – Blue-spotted Hawker Adversaeschna brevistyla on the Summit Track. 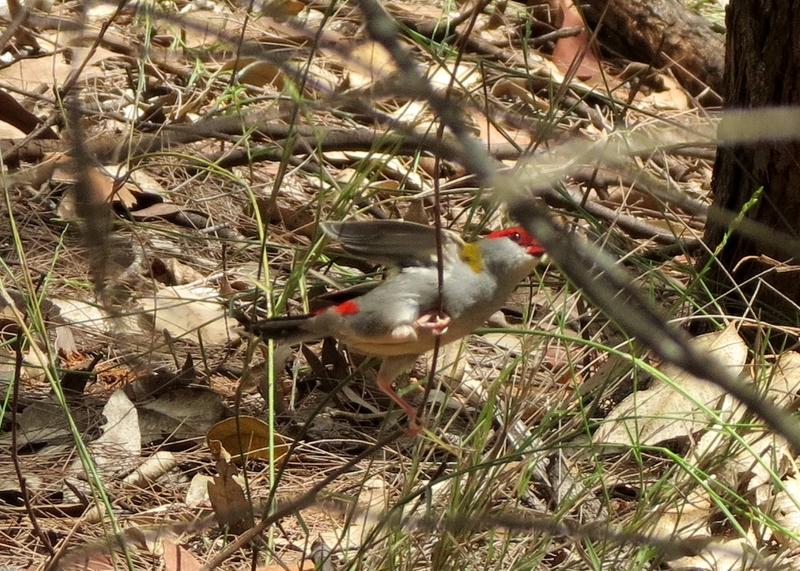 Thanks to Graham McDonald for the id. 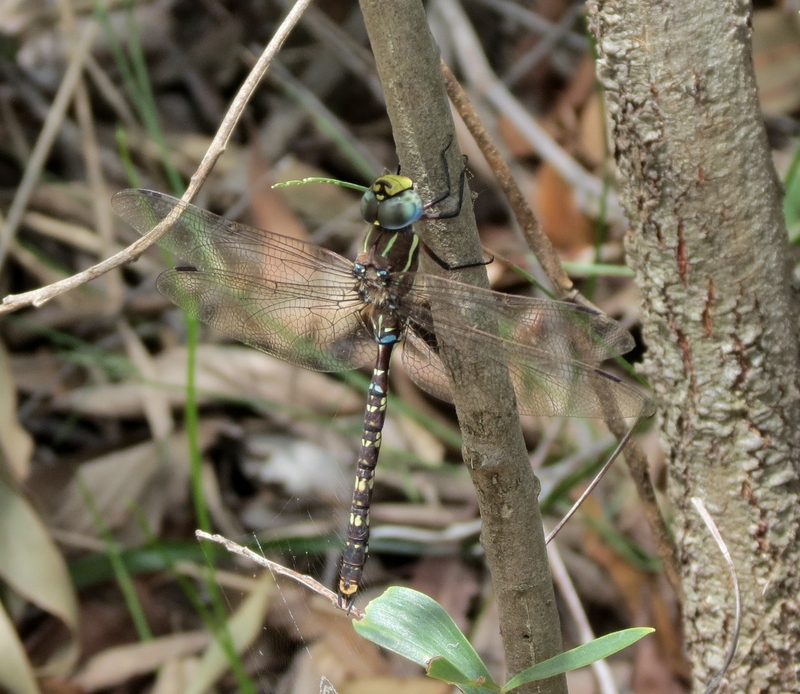 You can see more info on this and other dragonflies at Brisbane Insects. 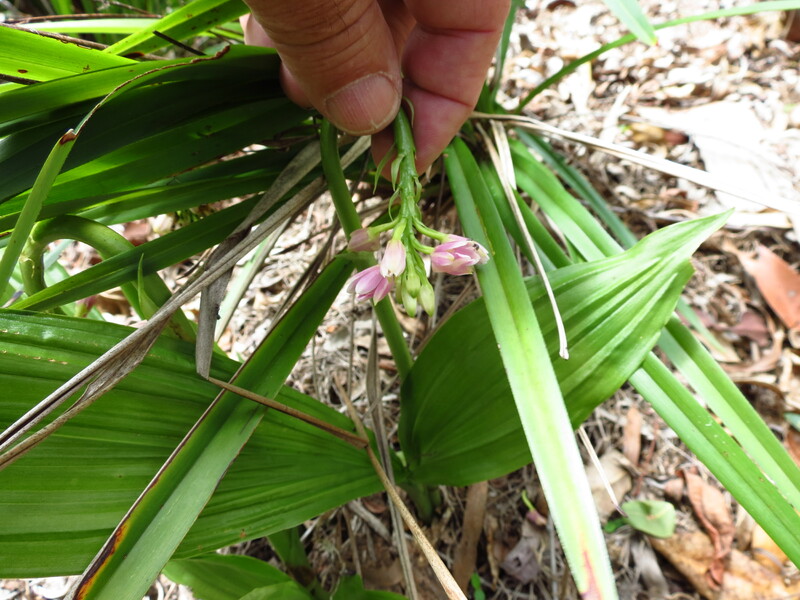 I also found the Shepherd’s Crook Orchid flowering again at the Fox Gully Bushcare site. This is particularly important as this beautiful native orchid has been returned to the Reserve as a result of restoration work undertaken at the Fox Gully site. 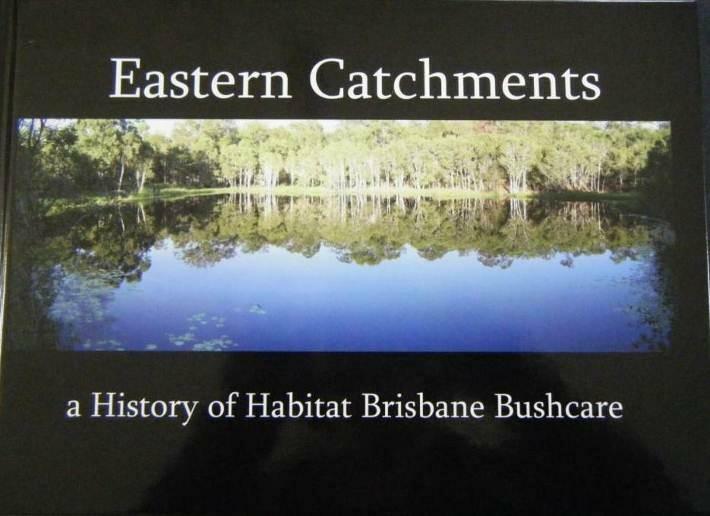 Yesterday I attended the launch of an amazing book which captures the history of habitat groups within the eastern creek catchments of Brisbane. The true genus of this book is that it is a compilation of stories written by group members and illustrated by photos submitted by each group. 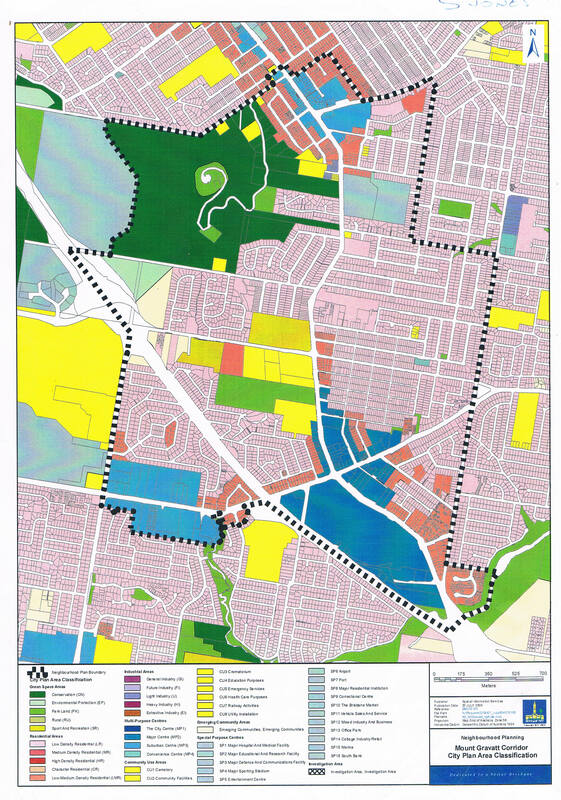 Each story paints a personal picture of a habitat community with group activities, community events and flora and fauna as seen through the eyes of individuals who truly care about that patch of urban bushland. Congratulations to the BCC Habitat Brisbane team members who bought this alive and thanks to the BCC Councilors who had the vision to provide the financial support. 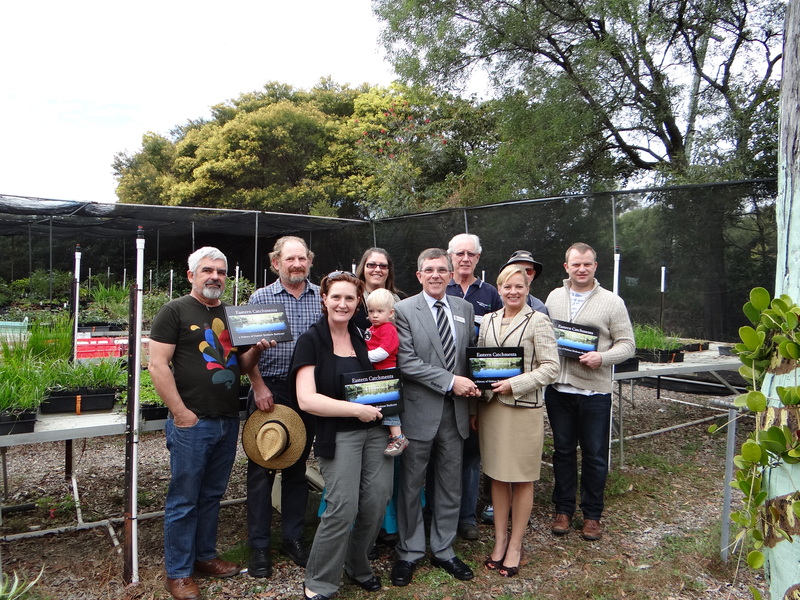 The launch was hosted by Bulimba Creek Catchment Coordinating Committee (B4C) at the Sustainability Centre and Native Plant Nursery. 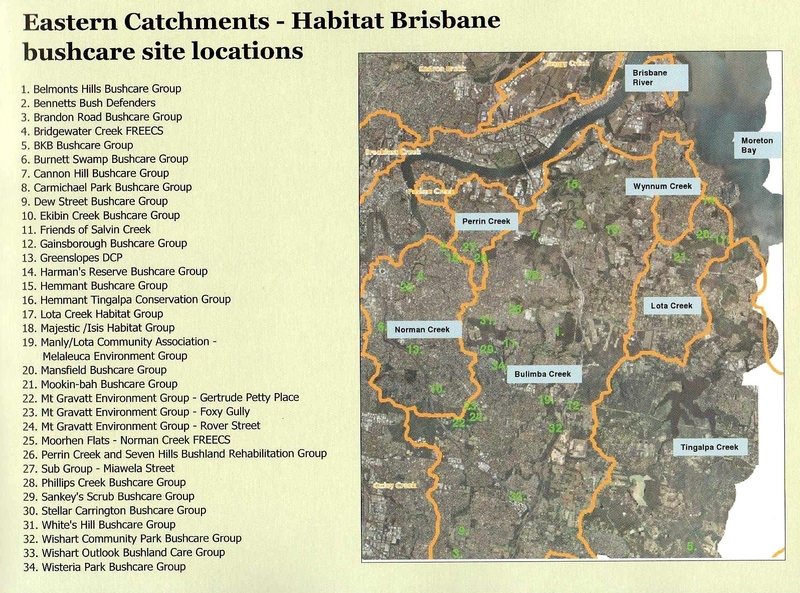 Reading the stories and understanding the scope of the Habitat Brisbane programme, this is only the Eastern Catchments, fills me with pride in our Brisbane community and hope for the future. Copies of this high quality small volume photo book can be ordered by emailing B4C. Cost is $120. 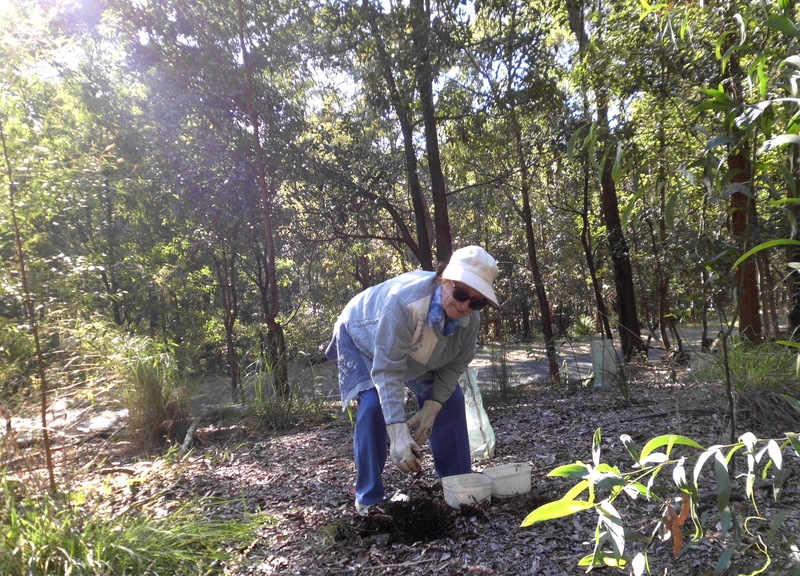 It’s beautiful in the bush on a sunny winter’s afternoon …..
After the fun of last week’s National Tree Day planting of 140 natives to attract birds, bees, butterflies and koalas, it was time to start watering. Council do not supply water for smaller plantings and we are not permitted to use mains water. Consequently we have to depend on water from our own garden tanks, which we bottle in recycled 3 litre milk containers and carry to site. 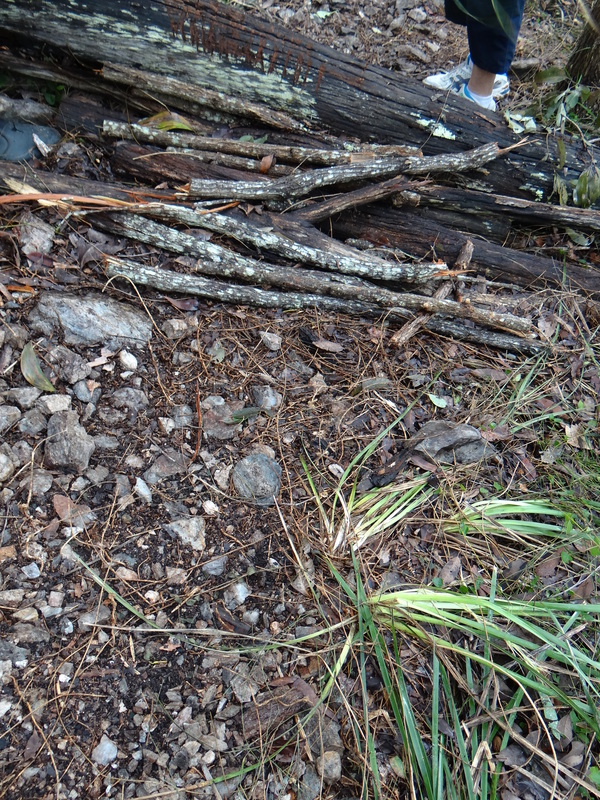 Sheamus shared the load and added a dash of worm juice to his bottles, which will give the plants a good start. We will continue to water weekly for a month, unless it starts to rain again. 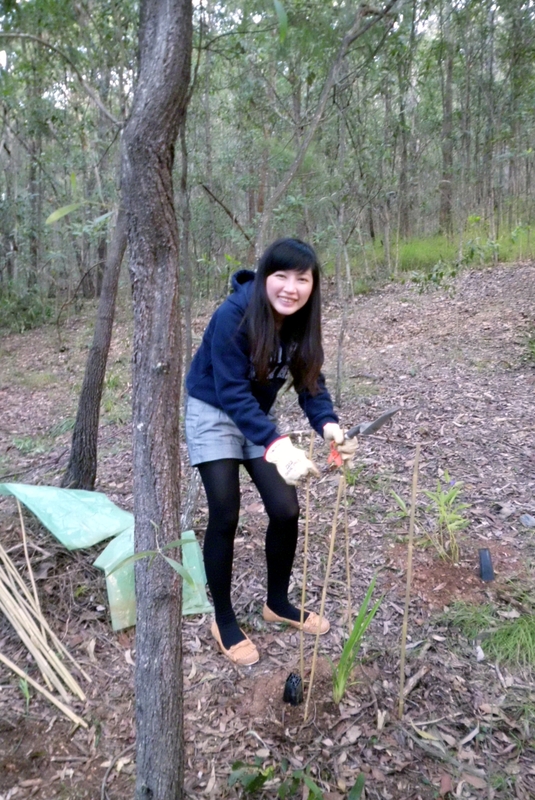 Mirandha and her Griffith Uni volunteer team of Lin, Lyn, Moeko, Thomas and Rashed joined our regular group members and quickly dispersed to water and put mulch around the base of our plantings. Next, it was back to the tedious task of removing Creeping Lantana Lantana montevidensis and Guinea Grass Megathyrsus maximus. 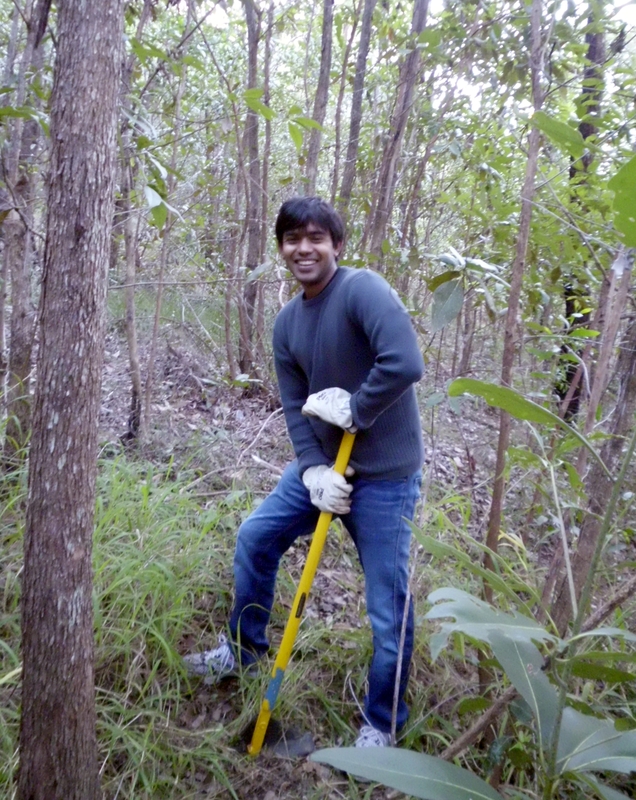 Rashed tried his hand at using our Tree Popper, a very handy device that grips and easily pulls deep-rooted weeds from the ground. His target was Mickey Mouse Plant Ochna serrulata, an extremely deep rooted weed that is now showing the first signs of flowering. With the arrival of Spring, the plants will fruit and birds will disperse the seeds all around the mountain and into our gardens. If we do not get all the plants out before fruiting time, we remove fruiting branches and return later to remove the rest of the plant. 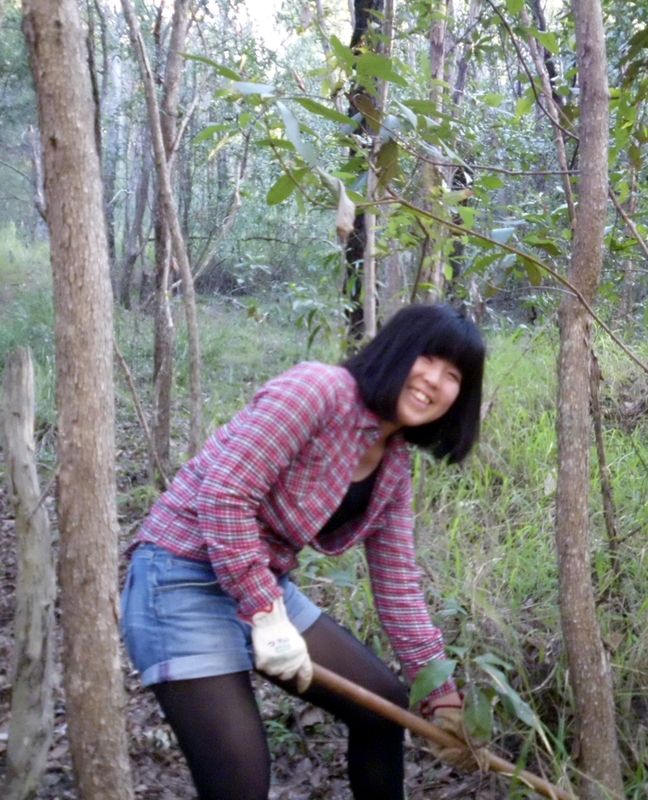 A lot of work was achieved at this regular Wednesday afternoon working bee. It’s so beautiful in the bush on a sunny winter’s afternoon – why not come out and join us, and meet delightful young people from all around the globe. and being prepared for our July 25 National Tree Day planting. The action was quite deliberate and systematic as the sign was thrown away and sapling Brush Box, Soapy Ash and Wattles were sawn off as well as broken down. Mountain biking is not allowed in the Reserve. 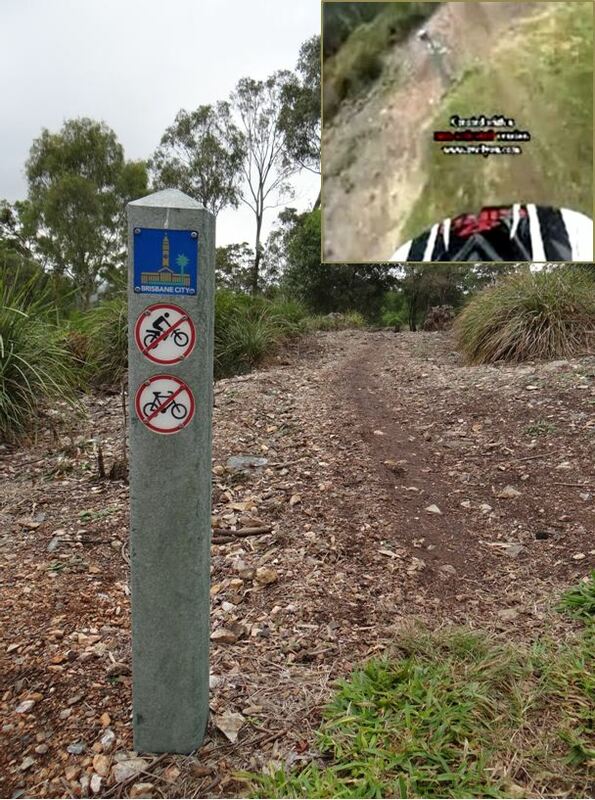 Signs at the Summit and at Gertrude Petty Place clearly state “No Motor Bikes No Mountain Bikes”. 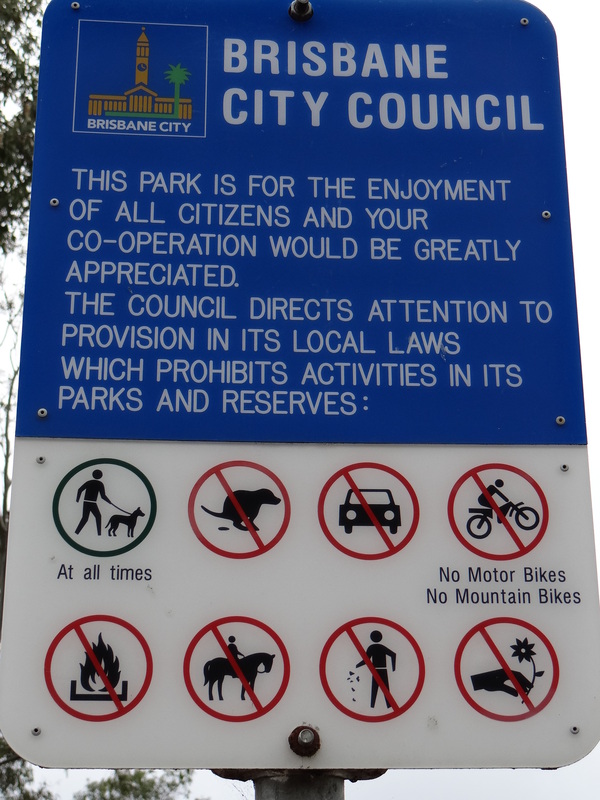 The mountain biking is not only illegal it is also damaging a unique environment that our community has fought to protect for over one hundred years: Mt Gravatt Historical Society, tells us that up till July 1893 the mountain and surrounds were designated as a railway timber reserve. 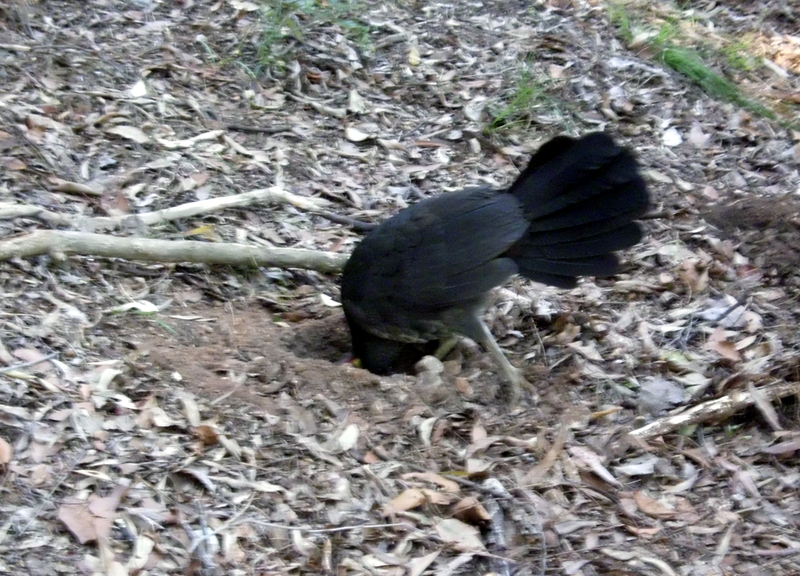 In response to community pressure the Queensland Government of the time protected this special habitat by declaring the Reserve. fascinating Four-Spotted Cup Moth Doratifera quadriguttata. Many Lomandras have been destroyed by the action of bikes, including a flowering (male) Many Flowered Mat-rush Lomandra multiflora, caterpillar food plant for Brown Ochre Trapezites iacchus and Black-ringed Ochre Trapezites petalia butterflies: two of forty-five butterfly species found in the Reserve. It is hard to show the enormity of the damage. 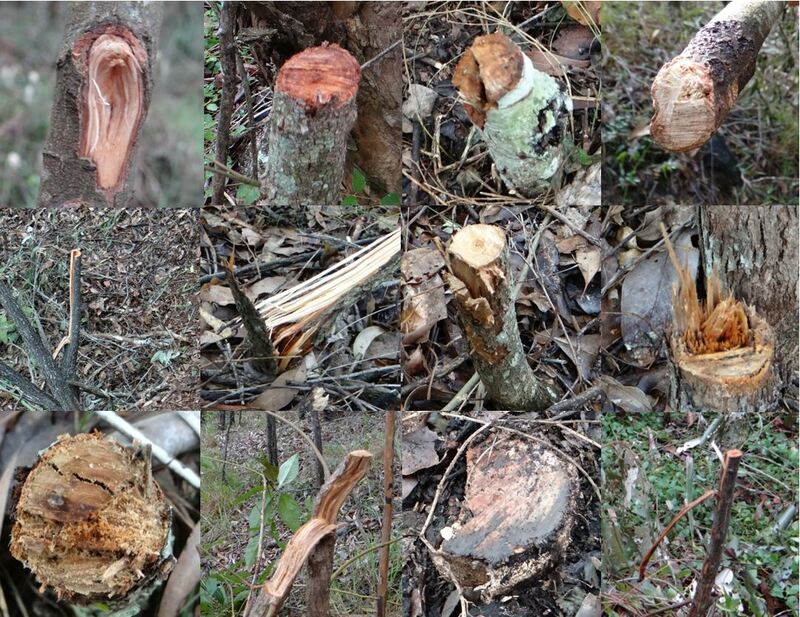 None of the trees were very large but the collage of cut stumps gives some idea of the number of trees destroyed to create track for entrainment of a small number of people. And by the looks of it this is only the start. Following the track down from the Summit we found yellow markers tied to trees, not only along the track but also what appears to be planned as a new track taking off to the south. 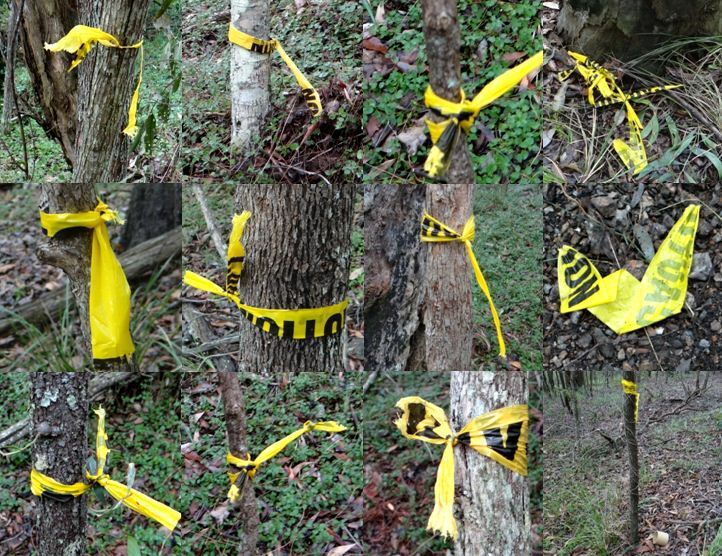 Trees had been cut or broken and yellow tape tied to others. It seems that this new track planning was only stopped when the tape ran out … evidenced by the empty spool discarded in the bush. 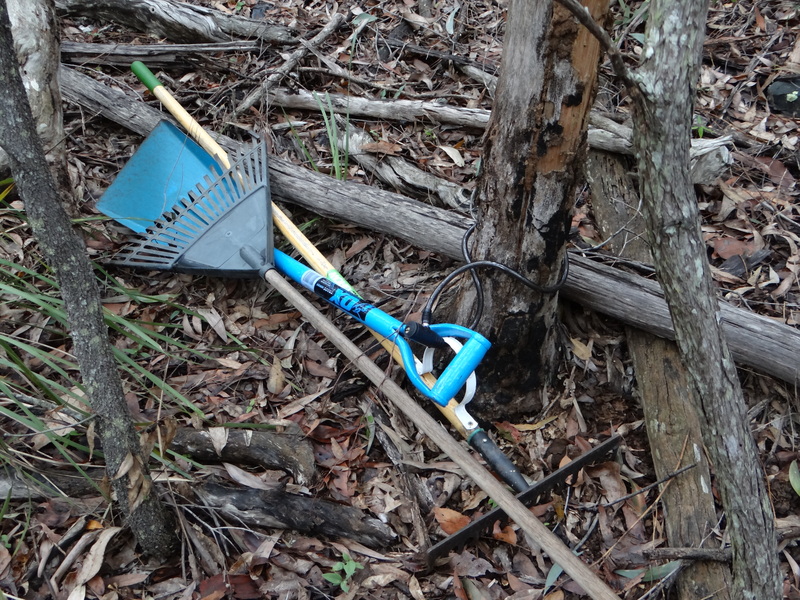 Further evidence of expansion plans is the cache of tools we found locked to a tree just near the path. Seeing the wanton destruction of our special habitat made me very angry, not just because of the personal impact on me, but also because this action ignores the huge ongoing contribution our community is making. 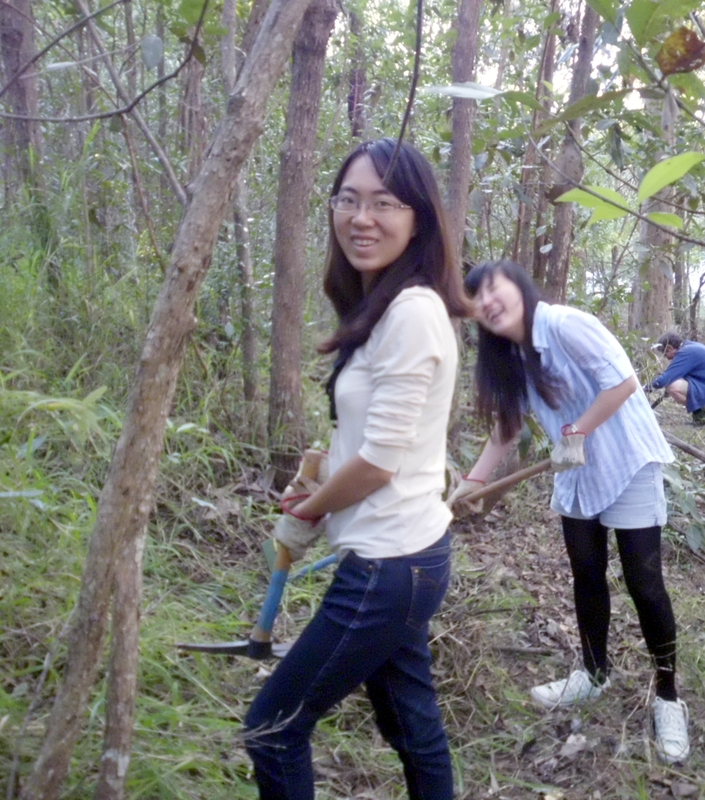 Conservatively calculated, Mt Gravatt Environment Group is responsible for over $30,000 in volunteer contribution during the 2011/12 financial year. Over the same period our community has invested $19,905 in grants from Queensland Government, Brisbane City Council and Southside Sport & Community Club. Donations and direct investments by community members exceeded $8,000. 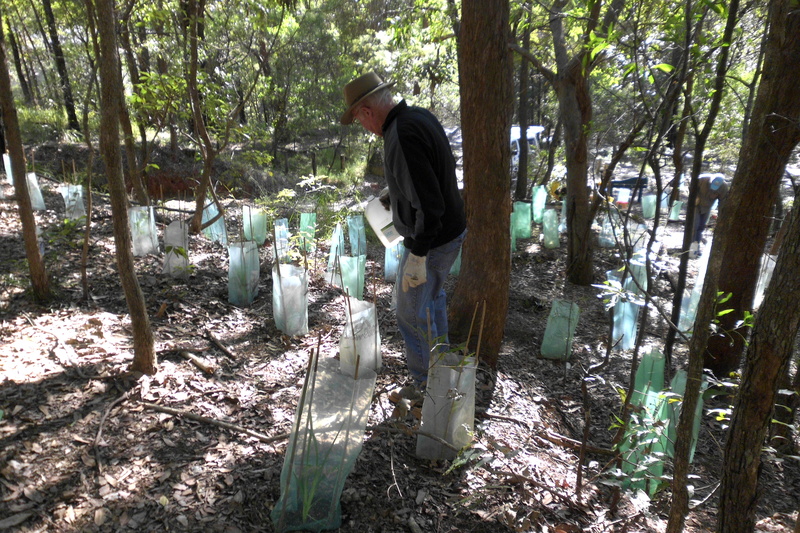 Ongoing support and investment by BCC Habitat Brisbane program: plants for revegetation, equipment, training and public liability insurance. 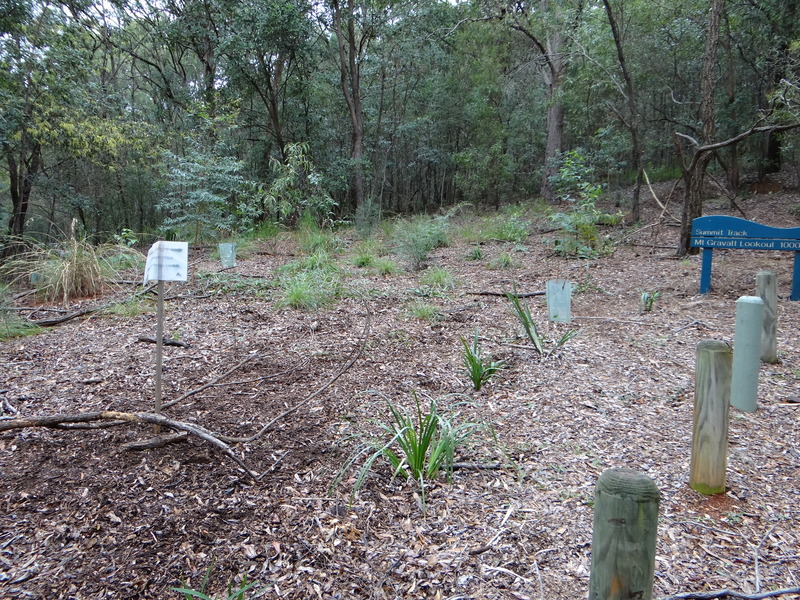 Community partners include Mt Gravatt Men’s Shed – nest-boxes, MacGregor Lions Club – native garden restoration Roly Chapman Reserve, Mt Gravatt Girl Guides – planting Pollinator Link garden, Griffith University – student volunteer program, QUT and Australian Catholic University student volunteers. 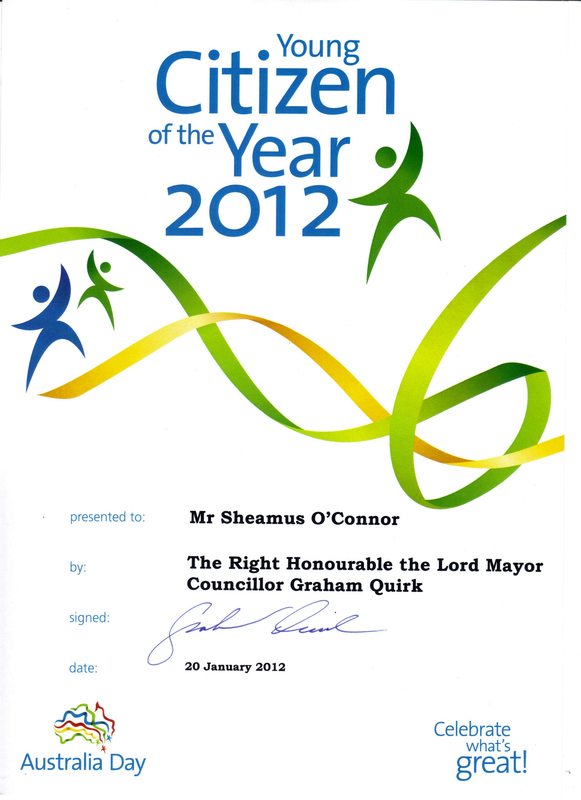 Our contribution has been acknowledged with a number of community awards. 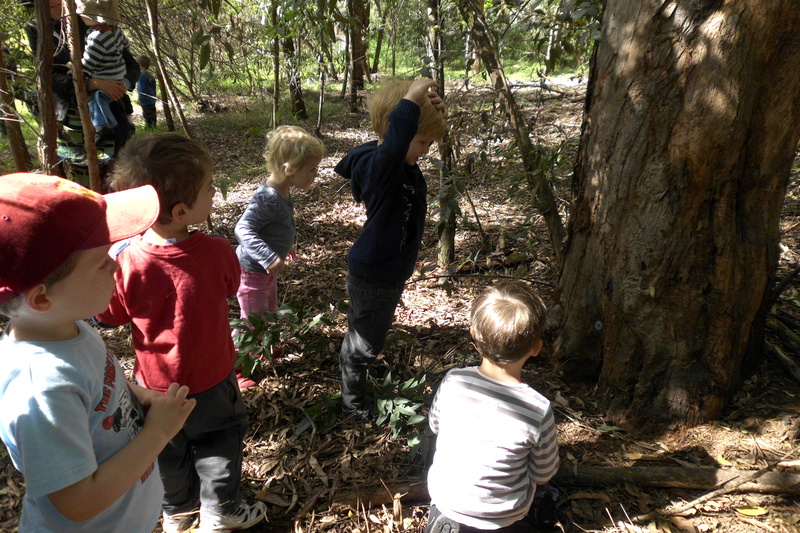 Today we had the pleasure of welcoming Holland Park Kindergarten families to Gertrude Petty Place for a bush adventure. The children were excited about catching up with their friends after two weeks holiday and were brimming with energy. We checked out a termite’s nest in an old ironbark gum where kookaburras nest each year and then headed off to search for native bee nests (Trigona carbonaria)in a nearby hollow tree trunk. The children have a native bee nest in a box at school, but they were fascinated seeing nests in the wild. After a walk through the bushcare site everyone was feeling tired and ready to tuck into a picnic morning tea before heading off home. 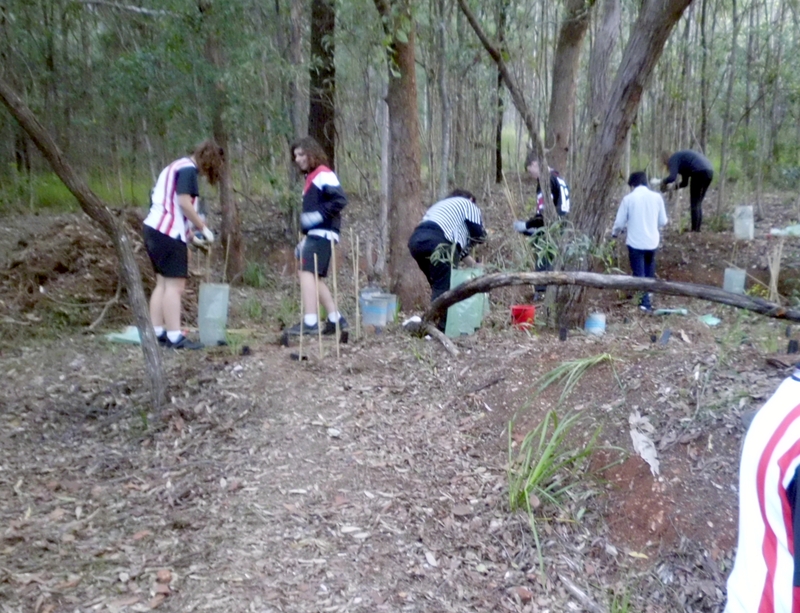 Our young friends left with some local native ground cover plants that will be planted in the school grounds to attract butterflies, birds, bees and frogs. 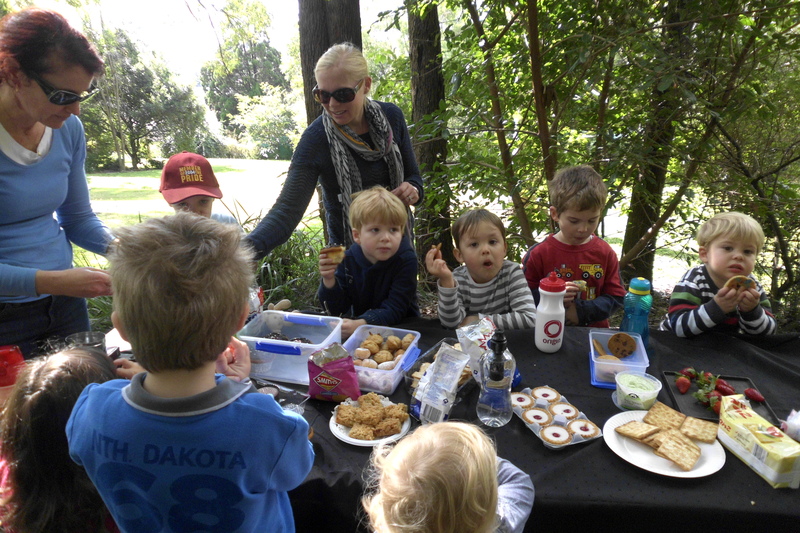 Thanks Amanda for organising this outing and we hope to see Holland Park Kindergarten back in the bush soon. Future leaders – amazing futures? 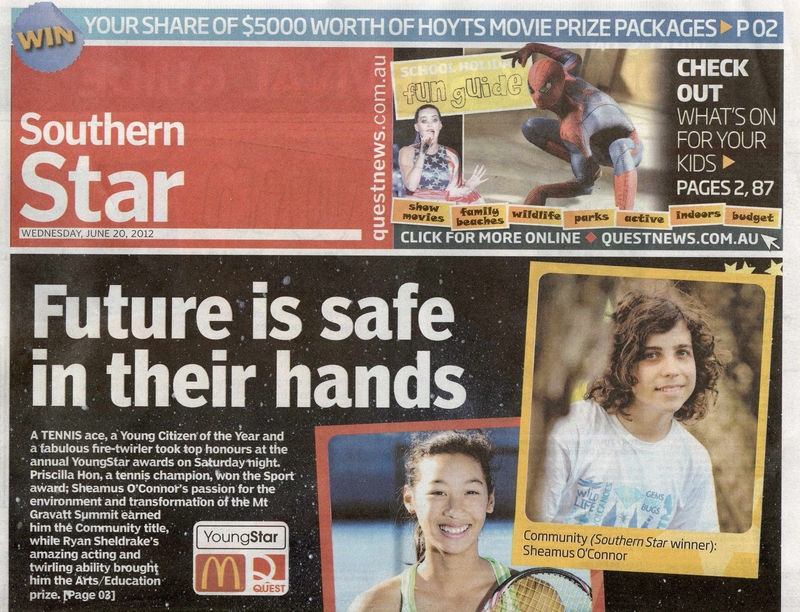 Our community can be proud of the young people on the front page of the Southern Star this week, and, the article suggests, we can have hope for some amazing futures to be created by them. 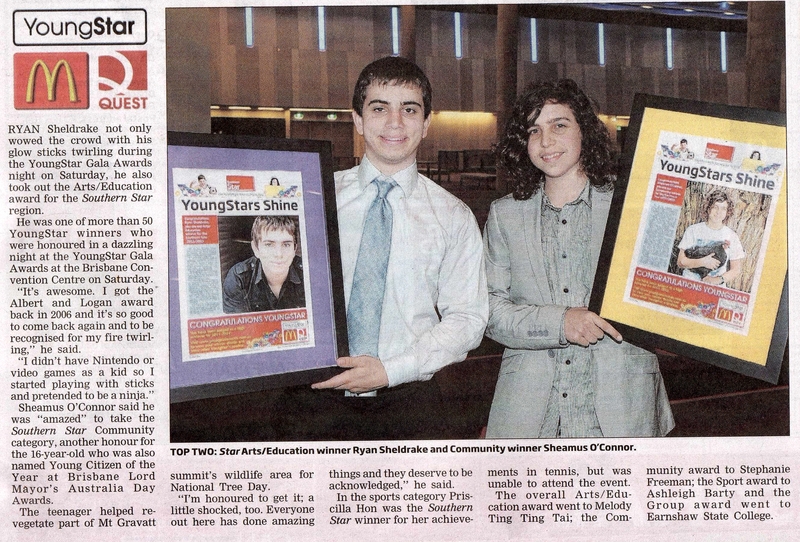 Mt Gravatt Environment Group and our sponsor, Bulimba Creek Catchment Coordinating Committee(B4C), are particularly proud of YoungStar Community winner, Sheamus O’Connor. More than 100 years before Sheamus was born, in July 1893, Queensland Premier Thomas McIlwraith “… in recognition of the resolve of the settlers, divided off 132 acres of the land [timber reserve], including Mt Gravatt Mountain, from the railway timber reserve.” Mt Gravatt Then & Now Mt Gravatt Historical Society. 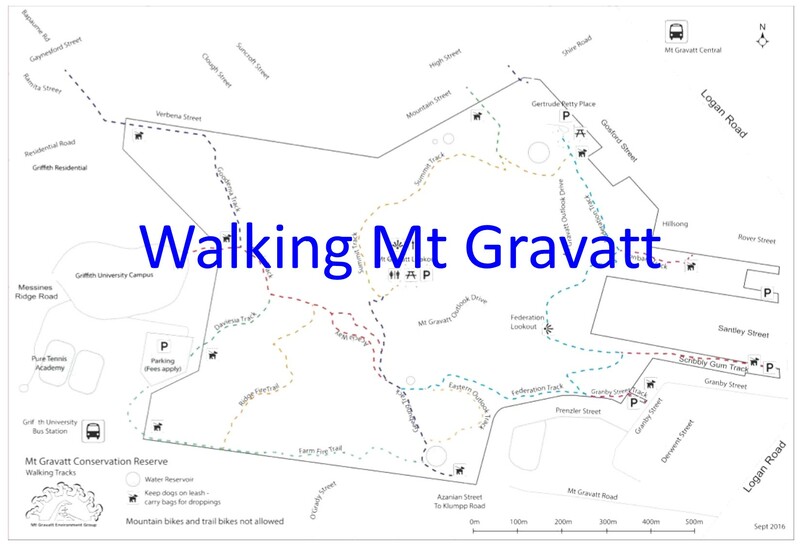 The vision of community members over 100 years ago means that today our community has Mt Gravatt Conservation Reserve, a unique habitat with Echidnas, Koalas and forty-five butterfly species only ten minutes from the Brisbane CBD. In another 100 years our Mt Gravatt community will reflect on the vision and commitment of young people like Sheamus who can see the value in being actively involved in restoration and protection of this unique habitat.